Suppliers in the Far East gearing up for Apple's "iPhone 6" are reportedly anticipating 20 percent growth from last year's iPhone 5s launch, setting the stage for the biggest iPhone debut yet. 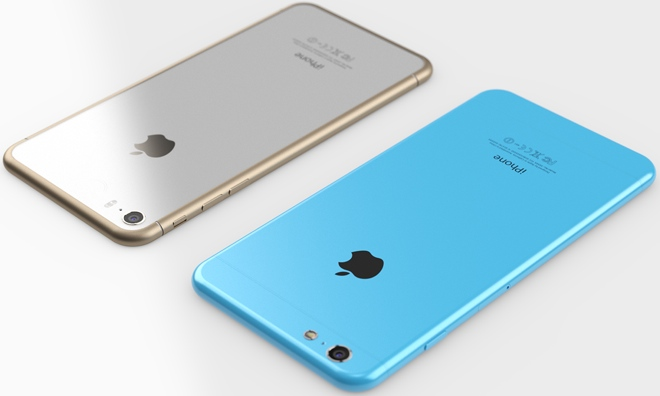 "iPhone 6" and "iPhone 6c" concepts by Martin Hajek. Analyst Katy Huberty of Morgan Stanley recently took a trip to visit technology industry component suppliers, who shared their expectations for Apple's next iPhone. From those conversations, Huberty said in a note to investors on Monday that she sees no major bottleneck for "iPhone 6" components, suggesting that Apple and its suppliers may not have a difficult time keeping up with demand. Apple doesn't break down iPhone sales by model, so it's unknown exactly how well the iPhone 5s sold at launch compared to the iPhone 5 a year prior. However, total iPhone sales in the December 2013 quarter were up just 6.7 percent year over year, which was a much slower growth rate than the company had seen previously. The indications from suppliers suggest that Apple's next iPhone, which is rumored to come with a larger display, could reignite sales growth. Huberty expects that the next iPhone could have a bill of materials $20 to $30 higher than the current iPhone 5s, largely due to the expectation of a larger display and improved camera. "However, we don't detect any abnormal component pricing pressure from Apple suggesting lower inventory, deprecation, and warranty costs along with the potential for a modest price increase and/or NAND mix change may help digest the higher (bill of materials)," she wrote. Beyond the iPhone, Huberty expects the rest of 2014 to be weak for the tablet market, including Apple's iPad. Her conversations with suppliers led her to forecast iPad shipments will decrease by 1 percent in the second half of the year and through 2015. Suppliers are also said to be skeptical about wearable devices, which leads Huberty to believe that the nascent market could provide an upside surprise in 2015 volumes. She predicts that if Apple were to launch a so-called "iWatch," it could outsell the iPad in its first quarter.